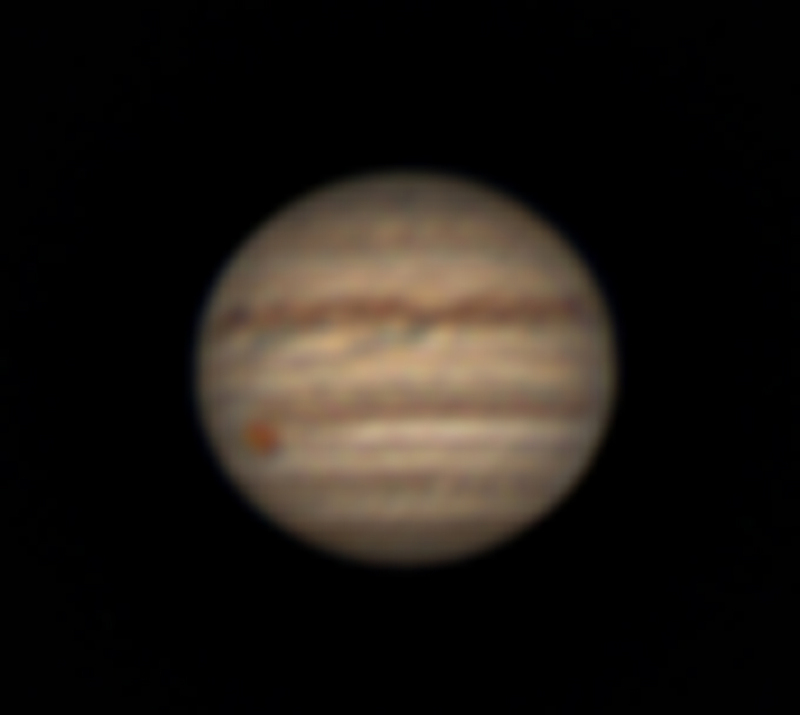 This article is a ‘work though’ of an imaging exercise of Jupiter at precisely the time of opposition in the early morning of May 9th 2018. At this time Jupiter, in Libra, had an angular size of 44.8 arc seconds and lay at a distance of 658.3 million km. There is a further part covering its imaging on the morning of May 14th. 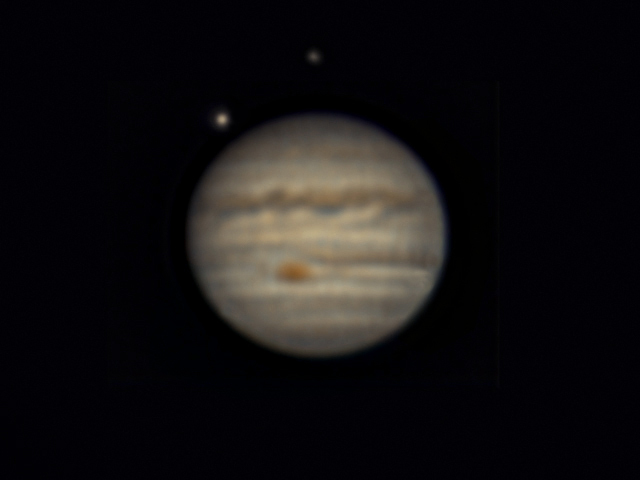 Sadly, from my location at a latitude of +53 degrees 15 minutes North, Jupiter’s elevation when due south was just 20.7 degrees, so I could not really expect a high quality result. Partly, I suspect, due to the low elevation the seeing was very poor but the final result was actually better than I had expected. Planetary imaging is probably the most difficult of all astrophotography tasks. The results improved immensely when ‘lucky imaging’ was introduced. A video camera, usually called a ‘webcam’, is used to take perhaps 2,000 video frames, each having a short exposure. It is hoped that some of these will be taken at times when the atmosphere along the line of sight is calmer than typical. Software aligns and stacks the better frames to give a result that is far superior than a single image. Amateurs began using the Phillips Toucam Pro II webcam but since then, webcams specifically designed for planetary imaging (including the Sun and Moon) have been produced by a number of manufacturers such as Imaging Source and Point Grey. For this exercise I used the Imaging Source USB2 colour camera, DFK 21AU04.AS. This has a sensor just 4.6 x 3.97 mm in size having ~330k, 5.6 square micron, pixels. Some years ago, the small sensor size was necessary due to the requirement of downloading the frames into the control laptop sufficiently quickly but now larger sensors can be used, the camera perhaps using a USB3 interface, though these are not really required for planetary imaging. The first problem is acquiring the planet onto the small sensor and then keeping it there as video sequences are taken. This requires a really solid, stable and well aligned mount. 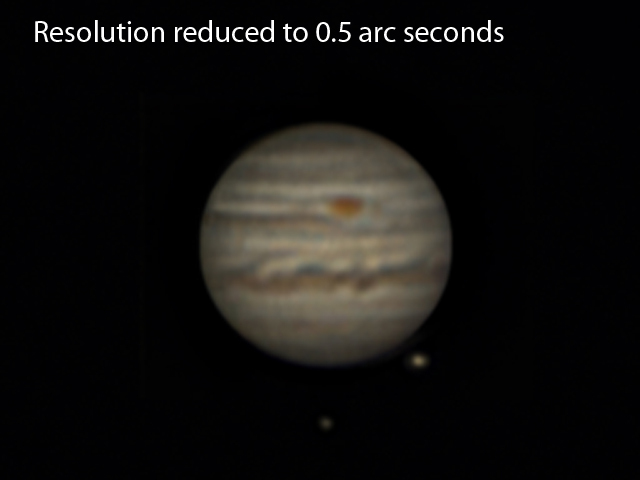 My Astro-Physics Mach 1 certainly achieves this and was aligned as soon as it was dark using a QHY Polemaster. This took just a few minutes. (An article reviewing this wonderful accessory can be found elsewhere in the Digest.) I omitted the final ‘fine tune’ step as I did not want the alignment to be too precise. The aim is to allow the planetary image to very slowly move across the sensor. This allows the Bayer matrix sensor design to better sample the colours and may also result in a slightly higher resolution image as the ‘Drizzle’ can reduce the effective pixel size using suitable processing software. In fact, the alignment was almost too good, but the turbulence in the atmosphere was moving the image around the sensor in any case. Given some choice, one then has to select a suitable telescope. Larger aperture scopes have a higher resolution but, as they will be observing through a larger column of air, it may only be worth using those of 8 inches aperture and above when the seeing is excellent. As I expected it to be poor, I chose to use my 127 mm, f/7, apochromat refractor. There in then the problem of placing the planetary image onto the very small sensor. The only way I know of achieving this without tearing out one’s hair is to use a ‘Flip Mirror’ such as that made by Vixen. 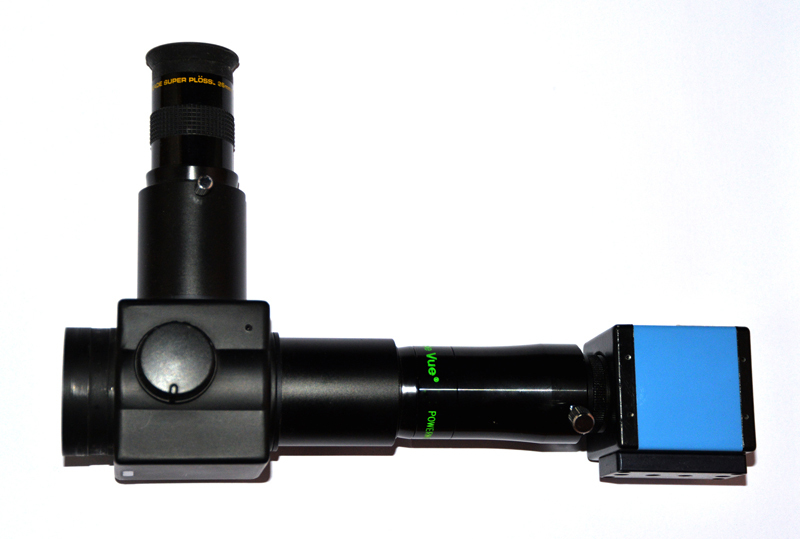 With the 45 degree mirror in place, the light is passed to an eyepiece. 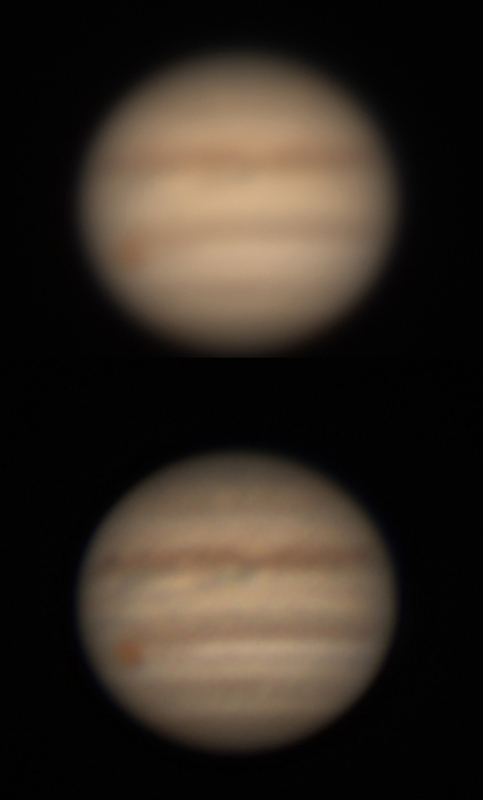 A long focal length, ~25 mm, eyepiece is first used to first locate the planet and the mount’s fine controls used to roughly centre it in field of view. 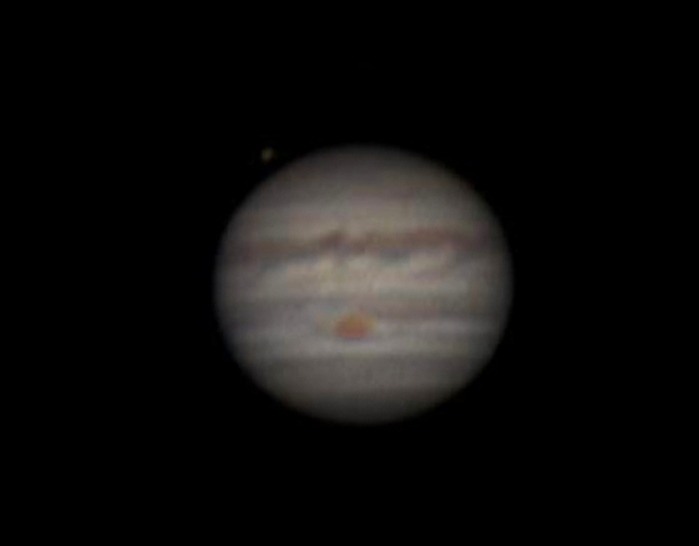 This is then replaced with a short focal length eyepiece with illuminated cross-wires so that, in this case, Jupiter could be perfectly aligned in its centre. Rotating the mirror out of the light path then allowed its light to fall onto the sensor for fine focussing. Just using my 890 mm focal length refractor, the image on the sensor would be too small to allow it to be well sampled. In general, unless a very long focal length telescope is used, a Barlow lens will be used to increase the image size on the sensor. But one then has to decide what magnification Barlow to use. One would like to sample the image as specified by the Nyquist sampling theorem which states that the angular size subtended by each pixel should be equal to or less than half the resolution of the telescope − in this case ~1 arc second. One should not try to exceed the minimum requirement too much as, with greater magnification, the image will be fainter so that longer exposures will be required reducing the possibility of acquiring sharp images. Using a x2.5 Televue Powermate, the effective focal length of my telescope is 2,222 mm so acting with a f/17 focal ratio. This focal ratio is in the right order with f/20 often suggested. With a pixel size of 5.6 microns, each pixel will subtend ((5.6/1,000)/ 2,222) x 57.3 x 3,600) arc seconds giving a result of 0.52 arc seconds. Thus, given the ~1 arc second resolution of the telescope, the Nyquist theorem is almost satisfied. But as described below, the effective size of the pixels can be reduced by applying a ‘Drizzle’ algorithm in the processing of the data. Vixen Flip Mirror and eyepiece, 2.5 times Televue Powermate and Imaging Source webcam. One can either use a colour or monochrome webcam, the latter requiring a set of filters. The use of a monochrome webcam and filter set can nominally produce a higher resolution image, but allowing the image to move slightly over the sensor during the taking of the video sequence and using the ‘Drizzle’ technique, I believe a colour webcam can achieve virtually the same result and the imaging is far easier to implement. Webcams will usually have gain and exposure controls. Using a high gain will give a noisier single image but the required exposures will be less and I was able to set the exposure to 1/45th second. With many frames stacked, the noise will be reduced so compensating for the greater noise in each frame due to the high gain used. There is then the question of the ‘codec’ used to encode the data. I am totally convinced that the Y800 codec that produces uncompressed raw frames should be used. This reduces the size of the video files − good − and does not require the camera software to de-Bayer the raw data. The de-Bayering method used by the acquisition software has to be very quick and it will probably use the ‘nearest neighbour’ algorithm which is not the best. 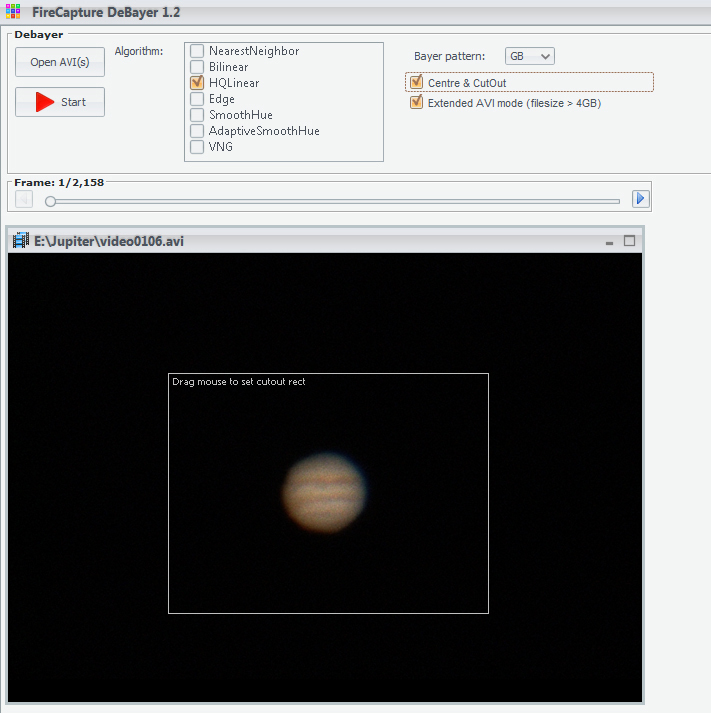 Problems (and solutions) when processing raw planetary video sequences in Registax. So video sequences of ~2000 frames length were taken and included those when Jupiter was around due south and thus at its highest elevation. Happily, at around the time of opposition, the Great Red Spot had come into view. The video files were processed the following morning. They were first deBayered using deBayer.exe to give 24 bits per pixel RGB .avi files. Note that the correct Bayer mask has to be selected – in this case GB, short for GBRG which is that used by the webcam sensor. One nice feature of the program is that it will produce a reduced size file by only outputting a smaller box area which surrounds the planet as seen below. AutoStakkert!2 was then used to analyse the video files. It was set to produce both unsharpened and sharpened images and, very importantly, to carry out an RGB align on the image to combat the atmospheric dispersion which will result from the low elevation. The AutoStakkert!2 processing screens. As described below, I have set the x1.5 Drizzle processing mode. I processed the video files using the x1.5 drizzle mode. This technique formally called the ‘Variable-Pixel Linear Reconstruction’ algorithm was developed for the Hubble Space telescope when the pixels of the first Wide Field Camera were too large to ideally sample the images produced by the telescope. 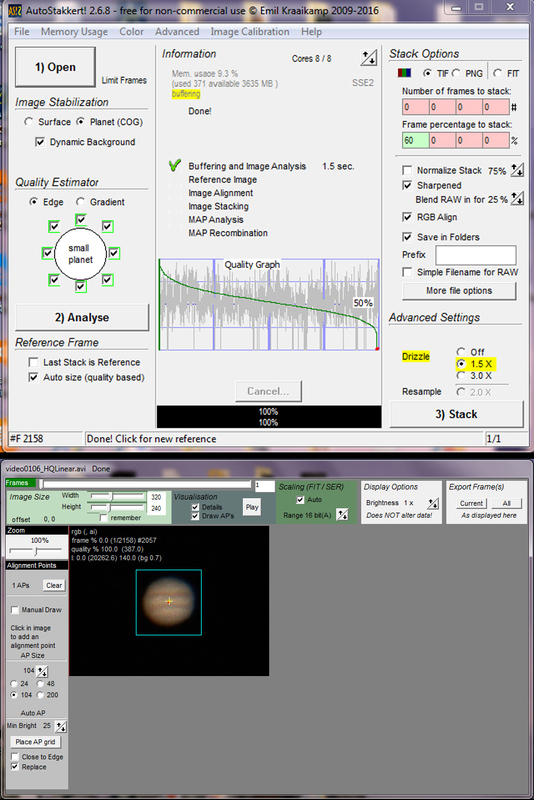 Although the sampling of the Jovian image provided by my Imaging Source camera nearly satisfied the Nyquist criteria, there was nothing to be lost (save an increase in processing time) by employing the drizzle mode. The image produced by AutoStakkert!2 would thus be 1.5 times larger than without using the drizzle mode. 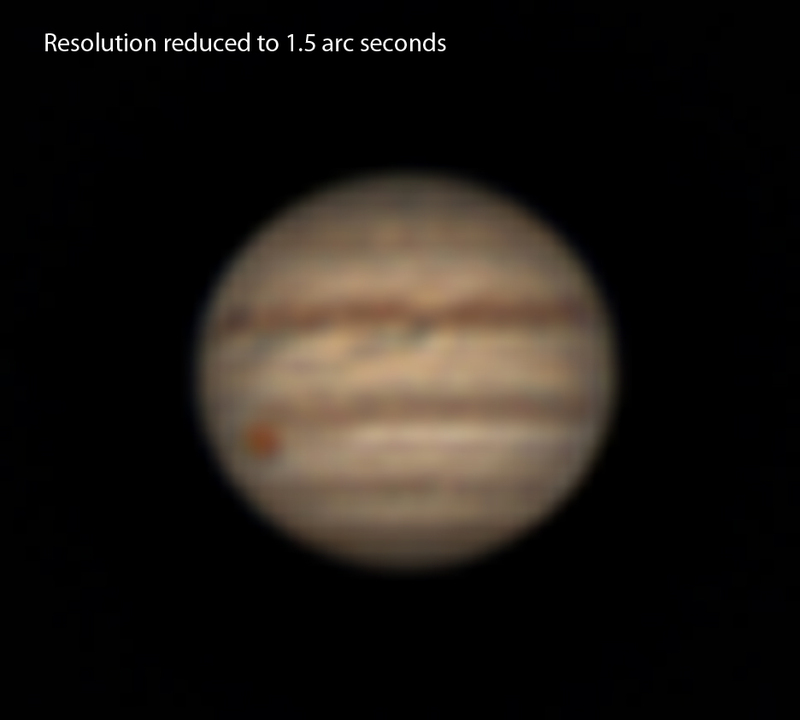 The resulting image of Jupiter was 125 pixels across and so, as Jupiter then had an angular size of 44.8 arcs seconds, each pixel subtended 0.36 arc seconds – a third of the nominal resolution of ~1 arc second of my telescope. The sharpened version was significantly better than the unsharpened one with both shown below. I am always amazed as to how much detail can be brought out provided the original image has very low noise. I was able to sharpen it a little more by a few application of a combination of a ‘Gaussian blur’ of 1 pixel followed by a small amount of sharpening using the ‘Smart Sharpen’ filter in Adobe Photoshop. I have found that the use of this technique can sharpen images without significantly increasing the noise. If one convolves the final image with a square function corresponding to ~1.5 arc seconds one gets the result below. 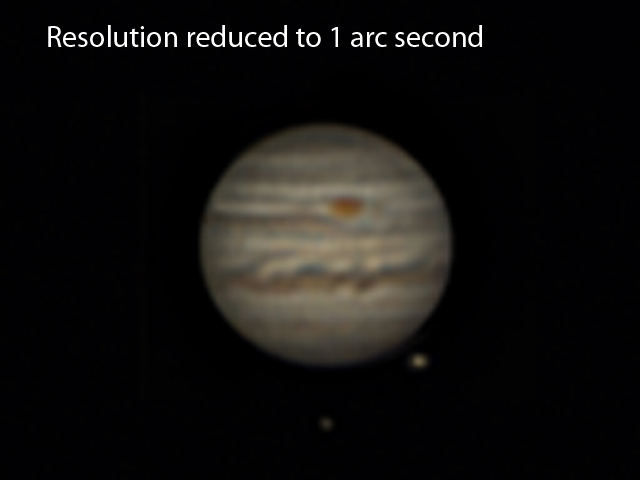 This implies that the resolution of the image above is somewhat higher than this and is close to 1.25 arc seconds. This was almost certainly too large an aperture. At times a small aperture telescope may only be looking through one cell of air within the turbulent region of the atmosphere. These will deflect the position of the planet over the sensor, but the images will be relatively sharp. The analysis programs can ‘follow’ the image and align and stack them. Unless the atmosphere is very calm, a large aperture telescope will probably be looking through several cells which will deflect the image in different directions and so blur the captured image even with a very short exposure. However a larger aperture telescope has a higher resolution so a compromise has to be made and the optimum size of telescope will depend on the seeing. With Jupiter at so low an elevation I suspected that one would not gain much by using a larger aperture telescope than the 127 mm refractor described above. Damian Peach has stated that it would not really be worth using a telescope with more than ~9 inches aperture in the UK. As I imaged with my 12-inch telescope, a friend not far away was using an 8.5-inch telescope so providing an interesting comparison. As before, raw videos of ~2,000 frames were taken, deBayered in deBayer.exe and processed in AutoStakkert!2 using 60% of the frames. For some unknown reason, the program was not able to produce a very good sharpened version though it had worked very well on the videos taken on the morning of the 9th. I thus used the sharpening technique described above using Adobe’s ‘Smart Sharpen’ and ‘Gaussian Blur’ combination. My result is shown below. The two satellites are Ganymede (the brighter) and Callisto. [Neither Stellarium nor Sky Safari had them in quite the right places.] The colour balance is obviously different and I think that the resolution was somewhat better than I expected. At almost the same time a friend, Stephen Faulder, had imaged Jupiter with his 8.5-inch Newtonian whose mirror was made by Henry Wilder. [I have a 10-inch Newtonian, now set up as a Dobsonian, whose mirror was also made by him.] His image is shown below and is, I think, better than mine. As an exercise of no great merit, I scaled, aligned and combined the two images (50% of each) which should result in a reduction in the noise in the image and thus allow a little further sharpening. The result is below. Could it be better than either of the two perhaps? As above, it is also possible to try to gauge the resolution of this image. This Jovian image is 252 pixels across so that each pixel subtends about 0.2 arc seconds. This in no way implies that the resolution is 0.2 arc seconds! If one convolves this image with suitable square functions – which could be a bit harsh – one can view the image with nominal resolutions of 0.5 arc seconds and 1 arc second as seen below. There is virtually no difference between the image above and that convolved down to 0.5 arc seconds – so the actual resolution must be less than this but there is a slight reduction in detail when convolved down to 1 arc second – implying that the actual resolution is a little better than 1 arc second – which is slightly better than that achieved with the 127 mm telescope. So, though using two larger aperture telescopes, there was only a small increase in resolution over that achieved with the 127 mm telescope – rather as I had expected. 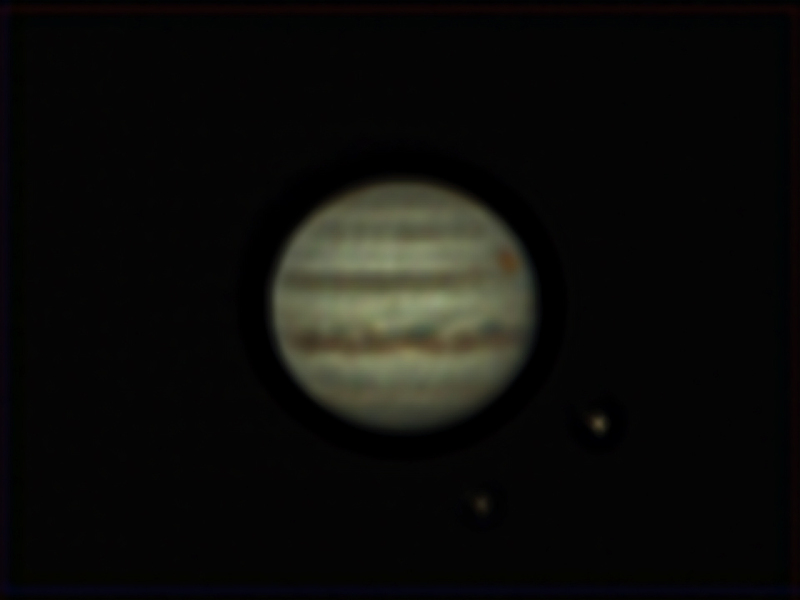 With Jupiter so low, I suspect that the optimum size telescope is somewhere between 5 and 8 inches in aperture. These images are not going to win any prizes and bear absolutely no comparison with some of those taken by, for example, Damian Peach. His best have, however, been taken in Barbados under a calm atmosphere using a 14 inch telescope! 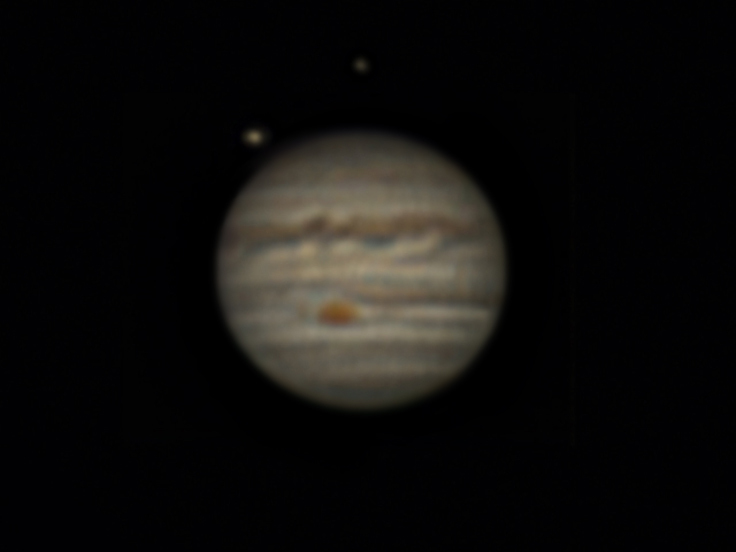 However, I do believe that it is typical of what most of us in the UK could achieve with Jupiter at a low elevation unless we are blessed with a night of exceptional seeing. Sadly, Jupiter is heading even lower down the ecliptic so its elevation at transit will not improve for some years to come.